The True/False Multiple Template provides a variation on the classic true/false quiz. The True/False Multiple Template provides a variation on the classic true/false quiz by allowing you to ask a true/false question and list multiple answers to that question. This allows you to have multiple true and/or false answers to the single question. Step 1: Select the True/False Multiple Template from the ‘Checkpoint Questions’ panel. Step 2: Drag your True/False Multiple Template into the Lesson Pathway. Step 3: Give your new Tile a title. Step 4: Click the ‘Edit Tile’ button. Note: From the edit screen, you can choose to change your title. Step 5: There will be a true/false multiple question preloaded in the ‘Checkpoint Question Editor’ box. Click the edit button to start creating it. Step 6: Enter the text for your new question. Step 8: You can include multiple True/False answers to the same question by using the 'Add Answer' button and following the same steps as in Step 7. 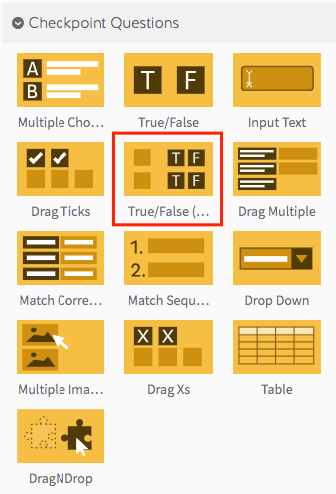 Note: The True/False Multiple Template offers three additional options. Firstly, you can provide custom feedback, which lets you add custom feedback text for both correct and incorrect answers. 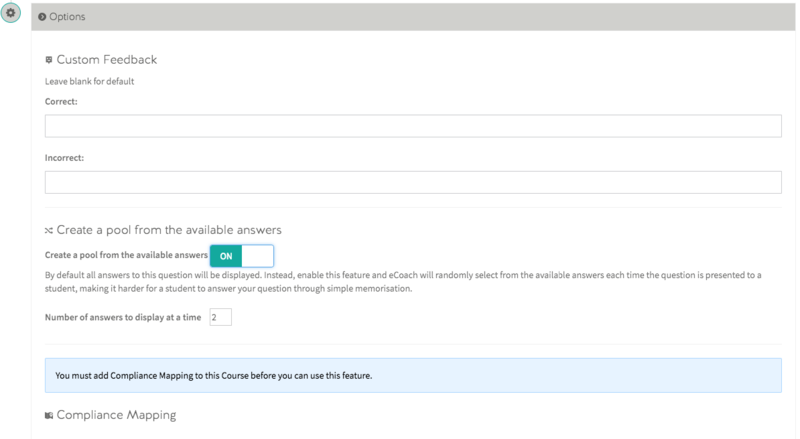 From the answers available you are able to create a pool from the available answers, if turned ON instead of all answers being displayed, Coassemble will randomly select from the available answers each time the question is presented. This makes it harder for a student to answer your question through simple memorisation, the number of answers to display can also be altered. You can also include compliance mapping for your true/false multiple question. To continue adding true/false multiple questions, simply go back to the ‘Checkpoint Question Editor’ box and click on the green ‘Add New Question’ button. Step 10: To preview your template, click on the ‘preview’ icon.